HUD homes and FHA loans can be used to enable those with low FICO scores to get adverse credit mortgages. The Department of Housing and Urban Development (HUD) offers insurance on mortgages, and when a homeowner with such insurance is unable to maintain the mortgage repayments, the lender forecloses and HUD pays the balance due. HUD then owns the home. The department then sells it as quickly as it can – which provides an opportunity for first time buyers or those with low FICO scores to buy a home at a low price at lower than average interest rates. The average price of HUD homes is around 20 – 30% lower than the true market value. The Federal Housing Association (FHA) is part of HUD. The FHA insures the mortgage loan, so lenders are more likely to offer loans irrespective of your credit rating or score. This is because they are guaranteed payment by FHA if you default. The decision whether or not to offer you a mortgage is therefore that of the Association and not the lender. With FHA loans you can get a mortgage loan by making a down payment of as little as 3.5%. To get this, your FICO score must be at least 580 – lower than the 620 needed for first time mortgages by regular lenders. It was 500 until January 2010. If your FICO score is lower than this, it does not necessarily mean that you cannot get a housing loan for HUD homes. If you can make a down payment of 10%, then the FHA will consider your application with a lower credit score. If you are in this situation, then you must either save up 10% of the purchase price or work to increase your credit rating. Since HUD homes sell fast, you should start working on these now, because it will be too late if you wait until you find a home you want to purchase. Go for whichever option is easier for you, although improving both would be best for you. If your FICO score is currently below 580, then start planning about 18 months before applying for the loan. Do what you can to improve your score. Here are some ways you can achieve that. Pay all your bills on time. Late payments will be recorded in your credit record which impacts adversely on your credit score. If you must pay late then contact your lender and come to an arrangement. Pre-arranged late payments are not recorded with Equifax or the other credit reference agencies. You might also be able to arrange to pay less each month over a longer period. Try to pay off as much of your total debt as possible, beginning with the debt charging the highest interest rate. Ask your credit card providers to reduce your credit limits. 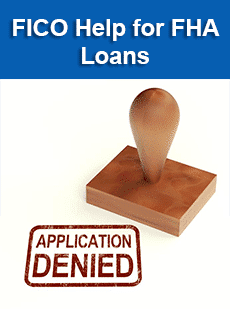 Do not apply for more credit, and do not close any credit accounts eve if you clear them. Closing accounts lowers your score, as do fresh applications. Improve your FICO score as above, and also start saving for your deposit. Assume you will be paying 10%, and if you can negotiate less than you have extra cash for redecoration and so on. If you are currently renting your home, make sure you make your payments on time and get a letter from your landlord stating that you have been doing so. Show some evidence of a possible increase in your income in the future. Try to go on a course relating to your work or some other way of displaying a desire for promotion. Get a guarantor or cosigner for your mortgage or loan agreement. The best action you take meantime is to seek the advice of a mortgage adviser who is knowledgeable about HUD homes and FHA loans. By following the above advice you will be taking the best possible steps to be able to purchase your new home even if you have a low FICO score. HUD homes and FHA loans are designed for those that have difficulty finding adverse credit mortgages from regular lenders, but not only those. Ordinary buyers can also be awarded such mortgages.